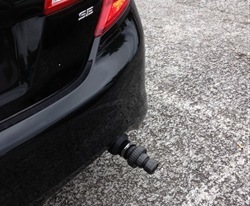 An innovative new device, developed by start-up company, Ecoviate aims to slash tailpipe emissions of existing vehicles in simple and affordable way. According to the firm’s Kickstarter funding page, the new CO2ube device, which fits onto the exhaust pipe of a vehicle, uses algae photosynthesis to reduce carbon dioxide emissions coming out of the pipe. It can be fitted to the exhaust of any vehicle and uses a strain of algae capable of thriving in the hot and toxic environment of a tailpipe. Using algae filters and a basic chemical reaction, the CO2ube is able to convert CO2 emissions into harmless and pH neutral sodium carbonate. The creators, Param Jaggi and Jonny Cohen, named as two of Forbes 30 under 30 entrepreneurs in 2012 and 2013, are hoping to gain approval for CO2ube-equipped cars to ride in high-occupancy vehicle lanes (HOV) lanes just as other ultra-low CO2 cars do, without the need meeting the occupancy minimum requirement. The filters in the device last about eight to ten weeks each, so would need to be changed regularly, but as Ecoviate is aiming for a retail price of $60, it could still work out cheaper than paying congestion charge fees. Although Ecoviate is still looking for more financial backers, the company plans to start production of its new device from this autumn in Nashville, Tennessee. Backers can receive their own CO2ube from a pledge of as little as $35.